David Cox spoke with Val Vale, Marian Wallace and Berlin radio maker Martina Gross after viewing Blade Runner 2049 on October 29, 2017. Syntronik offers the largest and best-sounding collection of classic synthesizers in a virtual instrument for iPad to date. This is thanks to a unique combination of the most advanced sampling techniques with a new hybrid sample and modeling synthesis engine, an arsenal of high-quality modeled effects and innovative instrument features that raise the bar for flexibility and sound quality. Each of the 38 synths in Syntronik for iPad was meticulously multi-sampled using the most advanced techniques available to capture the “DNA” of the hardware and accurately reproduce the real sound of the classic synthesizers. Adding even greater realism, IK’s proprietary DRIFT™ technology varies the phase, color and pitch of the sampled oscillators in a subtle fashion to keep them moving just like real analog oscillators. The unique hybrid synthesis engine in Syntronik for iPad provides ultimate sonic authenticity thanks to its modeled filter section built by IK, the company that pioneered virtual circuit modeling. Syntronik offers 7 filter types including 4 of the best sounding analog filters of all time: the Moog transistor ladder, Roland’s IR3109 chip, the famous Curtis CEM3320 chip and the Oberheim SEM state variable filter. Also included is a Classic low-pass filter and powerful digital filters like Formant and Phase. Plus, all 7 filters can be selected within each Synth, enabling users to mix and match them – like using an Oberheim filter with Moog oscillators – for unique combinations never heard before. Syntronik for iPad lets users forge, mangle and shape sounds in all possible ways thank to 37 professional effects ranging from dynamic processors to amps, filters, EQ’s, modulation effects, reverbs and more. 5 effects can be simultaneously inserted on every instrument via an attractive “lunchbox-style” interface that allows for immediate visualization and editing of every parameter from a single screen. The 17 powerful Synths in Syntronik for iPad are easily recognizable by their elegant interfaces with consistent controls for ease of use. Sounds can be loaded into 4-part layered “Multis” with each part containing its own instrument, key splits, arpeggiator and dedicated 5-slot effect section for ultimate sound design flexibility. With 1200 stellar sounding instrument presets, 200 carefully programmed Multis, (available in the full version or with all 17 synths), and 129 compelling arpeggios, Syntronik provides an inspiration factory covering any genre or style of music. Syntronik is now available for free on the App Store and includes 25 instrument sounds from 17 synths. Please download it on the App Store. Syntronik Full offers a more comprehensive experience with introductory pricing of $39.99, available as an in-app purchase. Individual synths are also available via in-app purchase for just $9.99 each. Ampeg SVX 2 for AmpliTube – the sound of the great Ampeg Amps modeled digitally! Ampeg SVX 2 for AmpliTube brings more power to bass players and music producers, giving them the opportunity to expand their collection with 2 amplifiers and 2 cabinets from the Ampeg Classic series: the SVT-VR and V-4B amplifiers along with the SVT-810AV and SVT-212AV cabinets. Also included from the Ampeg Heritage series is the highly sought-after B-15N amp and its matching cabinet, the B-15N 115. Ampeg SVX 2 provides the genuine tone, dynamics and feel of these iconic amps thanks to IK’s industry-leading modeling technologies. Dynamic Interaction Modeling™ not only recreates every individual physical component in the amplifier’s design, but also the nonlinear behavior between each component and its interaction with other components in the circuit. This provides an unprecedented level of realism, touch and feel for each amp. The Ampeg SVT-VR is a vintage reissue of an early 1970’s “Blue-Line” SVT head. The preamp stage, power section, and even rocker switches emulate the exact signal path, tone, and vibe of this original rock ‘n’ roll workhorse giving all the growl one might ever need. The Ampeg V-4B 100W all-tube bass amplifier is a remarkable reissue of the legendary 1971 original, delivering the pure tube vintage sound, attitude and unmistakable grind that earned this classic amp a place in bass history. The Heritage B-15N amplifier features distinct switchable 1964 and 1966 channels with Ampeg’s flexible Baxandall type bass and treble EQ controls along with selectable cathode or fixed bias providing the ultimate control over response and tone. The Heritage B-15N meticulously recreates the world’s most recorded bass tone. Powerful, tight and focused bass sound. This is the classic Ampeg cabinet seen on stages worldwide. The Infinite Baffle™ design has stayed the same since 1969 and delivers the punchy, round sound that is the hallmark of Ampeg tone. The Ampeg SVT-212AV cabinet delivers pure Ampeg tone in a ported cabinet design, featuring 2×12″ custom LF drivers and a 1″ compression driver, with a 3-way level control, that bridges the gap between fast transient response and a rich, powerful low end. The perfect companion to the B-15N. This cabinet features a 15″ speaker that delivers pure, full-bodied and vintage-sounding tone, reminiscent of the good old ’60s, that suits a wide array of musical genres. Ampeg SVX 2 for AmpliTube works perfectly with IK’s iRig line of mobile digital interfaces, like the iRig HD 2 or the iRig Pro I/O, to record and process bass tones on the go and on stage with the best-sounding virtual amps and effects ever created. Because Ampeg SVX 2 runs from within AmpliTube for Mac/PC, it offers a full-rig signal path ready to use in any production: tuner, pedalboards, amp head preamp, effects loop, power amp, speaker cabs, mics with room effects, and rack effects. Plus, two complete rigs can be configured and run in stereo. Ampeg SVX 2 for AmpliTube is available now for $/€99.99* from the IK Multimedia website, the AmpliTube Custom Shop and participating IK retailers. 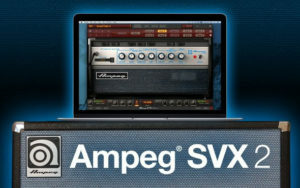 Ampeg SVX 2 for AmpliTube is also available to currently registered Ampeg SVX users for the upgrade price of $/€49.99. Individual amps are available for $/€34.99 each and cabs for $/€14.99 each via the AmpliTube Custom Shop. Thanks to Starr Ackerman from IK Multimedia for the heads up! Three years ago when I started my Rocket Opera project I wanted to reproduce something of the quality of early 1970s BBC “station break” productions. These were ‘fillers’, usually animated films that had been imported from Eastern Europe: Yugoslavia, Czechoslovakia, Hungary. heavy reverberation, vocal singing parts, traditional instruments and the occasional early synth sound. Weird, unusual films by people like Jiri Trnka, Jan Swankmayer that without ever directly criticising the Soviet regime, did so in spades by just being so irreverent. Surrealist anti-common-sense that supposedly expressed the frustrations fears and anxieties of those living in the shadow of the Russian system. Or something. the Apollo crew to navigate the dark side of the moon for the first time in 1968. The keyboard sounds needed to match. Stereolab at their best mimic this musical period in their most unusual and offbeat recordings. Music soundtracks on theses films would be synth and traditional combined and was experimental to say the least! When I first heard Stereolab I was impressed by was how offbeat it was and it reminded me in some ways of this early ’70s BBC station filler music. For the synths I used VSTs and Garageband. I had to go a bit deeper and look into using bits of other programs – it was difficult to bring together all the VST syths I wanted back in 2013. 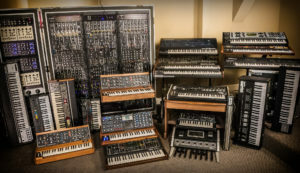 These include such classics as the Prophet 5 and the Galaxy as well as the miniMoog. Why have all the synths when you have the plugins? Who wants to have all the hardware lying around? The sound is the sound is the sound! Lifting heavy wood steel and plastic gear is not something I want to do for the rest of my life! Sampletank another software system for deploying this and other IK plugin instruments makes a great “sister software” and along with this comes some awesome FX rack effects: tape echo, overdrive etc. Another plus is something called sequencing Drift which is a boost to oscillator based synths making them sound fatter, cleaner, and more rounded. I fully recommend Syntronik – the world’s first really well thought through and well planned VST package and ‘ecosystem’. from any previously purchased product of a value of $/€99.99 or more. The ultimate sound and groove workstation – Now with Custom Shop! The affordable sound and groove workstation – Now with Custom Shop! The complete sound and groove workstation. Includes over 4,600 instruments and 52GB of samples. The ultimate studio bundle: Includes AmpliTube MAX, SampleTank MAX, T-RackS MAX and Miroslav Philharmonik 2. Syntronik is a cutting-edge virtual synthesizer that raises the bar in sound quality and flexibility thanks to the most advanced sampling techniques combined with a new hybrid sample and modeling synthesis engine. Syntronik includes 17 amazing instruments, available as a collection or separately, with over 2,000 preset sounds covering a wide selection from 38 of the most iconic to ultra-rare and painstakingly multi-sampled vintage synthesizers. Syntronik’s synthesis engine goes well beyond traditional sampling thanks to a brand new analog modeled filter section created with the utmost expertise from IK, the pioneer in virtual circuit modeling. This is coupled with exclusive DRIFT™ technology to accurately reproduce the behavior of oscillators from real hardware synths. All of this combined with an effects section that is unrivaled in the world of virtual instruments along with advanced features like 4-part layers, splits and arpeggiators make Syntronik the ultimate source of inspiration with the widest palette of synthesizer sounds ranging from exact reproductions of the originals to sounds never heard before that will stand out from the crowd in productions covering any genre and style. When it comes to accurately reproducing the sound of timeless machines like Moog, Oberheim, Sequential Circuits, ARP, Roland and Yamaha vintage synthesizers, sampling their sound-generating oscillators is the only way to ensure truly authentic sounds. We selected some of the most sought after synthesizers, sourced only the best instruments from private collections, and painstakingly sampled them. Sound designers worked hand in hand with software developers to take full advantage of this “synthesizer DNA,” with the goal of offering a highly flexible instrument that would maintain the exact sonic character of the originals while extending their creative potential even further. We have captured multiple round robins of single oscillators, oscillator combinations (including sync and FM sweeps) and after more than 70,000 samples and 50GB later, Syntronik is ready to set a new standard in the world of virtual instruments. Like as if you had the ability to go out to order ANY synth you wanted – you order what you need. When I write more operas I’m going to rely heavily on Syntronik – its a lifesaver! Well done IK Multimedia for another triumph! Gary Lineker explains why he believes Manchester City winger Raheem Sterling should win the Professional Footballers' Association Players' Player of the Year award. Callum Hawkins talks us through his ultimate music playlist to listen to while running the London Marathon. Jeremy Corbyn vows to protect "lifeline" services but the Tories warn motorists will be "clobbered".